Good ole’ figures of speech such as “going down swinging,” “take a roll of the dice” and “gotta’ be in it to win it” didn’t apply to the Ducks on Saturday. The Ducks offense was the equivalent of a baseball team whose batters stood at the plate all game long with the bat firmly resting on their shoulders. They were hoping to get walked or hit by a pitch, or maybe capitalize on wild pitches or whatever else the opposing team was willing to give them. What they were not doing was swinging for the fences. And against a superior Washington team, that’s exactly what the Ducks needed to do. There’s “playing to win” and then there’s “playing not to lose.” The Ducks did neither as they appeared to play “to not get blown out.” Safe to say it didn’t work. BURMEISTER: Caught in a rare passing motion. The Ducks game plan was without the goal of victory. The Huskies are bigger, stronger and faster, and have an excellent defense. What worked against Utah the week before was not going to cut it. Trying to grind it out against the Huskies was a slow and painful death. Which begs the question: do the Ducks even know how to take a swing? Installing a conservative passing game doesn’t mean you can only throw the ball horizontally; short passes down the field are still ok. Saying the Ducks lacked creativity in their play calling is to be kind. It felt like they weren’t even trying. Taggart could have looked across the field for inspiration to a man who made a name for himself by gambling, rolling the dice and swinging for the fences. Coach Chris Petersen was the master of taking down more talented foes by installing trick plays, confusion, misdirection and generally keeping the other team on its heels. Certainly this isn’t to say the Ducks would have won if they had tried, but at least give the folks at home a show and something to get excited about. After all, sports is part entertainment, and damn it, this is Oregon! 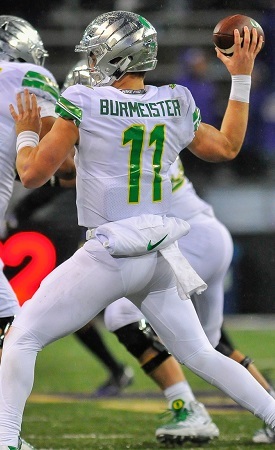 A) Braxton Burmeister ran for 38 yards … while going 7 of 13 for 31 yards passing. B) Oregon’s 31 passing yards was the fewest allowed by Washington since 2004. C) Burmeister attempted one pass longer than the nine-yard completion he had to Jacob Breeland, an incompletion thrown out of bounds to Dillon Mitchell. D) Late in the first quarter, the Ducks had already surpassed Washington’s average of 71.6 rushing yards allowed, the second-lowest total in the FBS. FREEMAN: Continues his record-breaking ways. E) The Ducks rushed for 247 yards, 116 more than UW had allowed in a game all season. F) After starting the game with two promising drives, Oregon gained an average of just 14.7 yards on each of its next 10 possessions. G) After the first quarter, Oregon gained 162 total yards during the final three quarters, averaging 3.4 yards per play. 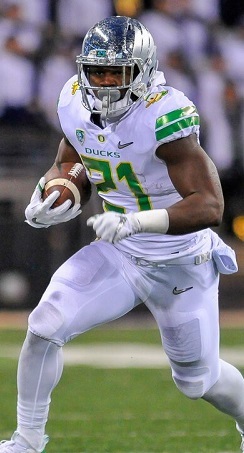 H) Royce Freeman is now 11th all-time in college football history with 5,364 rushing yards. He ran for 122 yards, his 29th 100-yard game. I) UO’s 130-game streak of scoring at least one touchdown is over. It was Oregon’s first game without a touchdown since losing 16-0 to UCLA in Pasadena in 2007. J) Oregon entered the game having lost 18 turnovers in nine games, which was tied for 115th-worst nationally. The Ducks added two more turnovers on Saturday. K) Oregon was shut out in the second half for the fifth time this season. L) UW’s Dante Pettis became the NCAA’s all-time leader in career punt return touchdowns (nine), broke the Pac-12’s career punt-return yardage record and tied the conference’s record with his fourth punt-return TD this season (tying Oregon’s Cliff Harris and Cal’s Desean Jackson). M) UO’s defense entered Saturday having allowed 20 plays of 30 yards or more, which tied for 87th nationally. Washington added to that total. O) Safety Brady Breeze got his first career interception. P) Since the year 2000, only one Oregon-Washington game has been decided by single digits (2015). 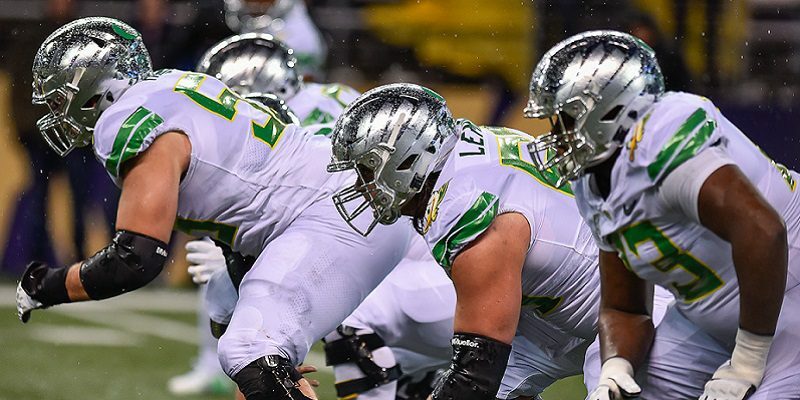 Q) Oregon’s 12-game winning streak against Washington is now a distant memory. UW has a two-game winning streak, outscoring the Ducks 108-24. In the grand scheme of things, this game doesn’t change anything. The Ducks weren’t expected to win and are biding their time for Justin Herbert’s return in two weeks to give them their best shot at earning a bowl invitation. Perhaps the primary strategy wasn’t to win, but to continue to get the young players experience and, in the process, the Huskies would hand the Ducks the game. But good teams—something the Ducks aspire to be—don’t do that. And the Huskies didn’t. The Ducks were a long shot in this game without Herbert; there were no real expectations of victory. This would have been the perfect time to experiment with various things that the Ducks hadn’t shown yet this year. But instead, they did exactly what everyone—especially the Huskies—thought they would do, and they got crushed.